The one-day sale on Wednesday for members of Amazon’s $99 per year Prime subscription service was similar to an annual sale by China e-commerce merchant Alibaba. Amazon offered discounts on products ranging from storage sets to robotic vacuum cleaners, generating more orders per minute at the peak than on “Black Friday,” the day after Thanksgiving and traditionally the top retail sales day in the United States, Amazon said. It did not give detailed sales numbers but said it sold 35,000 Lord of the Rings Blu-Ray sets in 15 minutes and sold out a Kate Spade handbag in a minute. Most buyers made purchases of upto 5 LG G4s because of the dirt cheap price it was listed at while others raised questions about whether it was a glitch or legit. 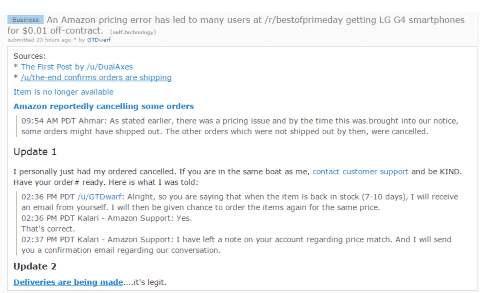 Finally another Redditor, the-end confirmed that Amazon was indeed delivering the LG G4’s at $0.01. LMAO! I wouldn’t even pay $0.01 for a crappy fashion statement iPhone 6.